When Ernesto Delgado created Tequila Museo Mayahuel several years ago, he intended to recapture the classic Mexican recipes he had eaten as a child. This dedication is apparent in the authenticity of the food and the quality to which it is prepared. Boasting a thoughtful cocktail menu that makes use of over 150 varieties of tequila, Tequila Museo Mayahuel is an excellent choice for upscale Mexican dining in Sacramento. For social drinkers, or cocktail enthusiasts new to the available varieties of tequila, the drink menu suggests an affordable tequila for each option. However, substitutions are encouraged, and the knowledgeable bar staff will help you determine what to try. The Maya Margarita ($8) is beautiful in its simplicity: Only lime juice and agave nectar enhance the subtleties of the tequila. For more complex cocktails, the Mayahuel Fresca ($9) uses cucumber and grapefruit juice to create a more bitter flavor profile, making it better to order as an aperitif. Many Mexican restaurants serve chips at the start of the meal; Mayahuel replaces this with a bowl of soup, themed to the season and changed every week. During my visits, I had lentil soup, which was warm, comforting, and just the right portion. Chips are available for $3, with guacamole for $8.50; the guacamole was good and the chips were crunchy and satisfying, but if you aren’t a big fan of chips you may want to save room for the rest of your meal. One of the most outstanding entrees was the Mole Poblano con Pollo ($18), chicken in a chocolate mole sauce. I have a high standard for poultry, but Mayahuel exceeded it: The chicken was moist and flavorful, the mild white meat contrasting with the rich and warm mole. Also excellent were the Trocitos de Puerco en Salsa Verde ($15), pork in a tangy green tomatillo sauce that makes me hungry just thinking about it. 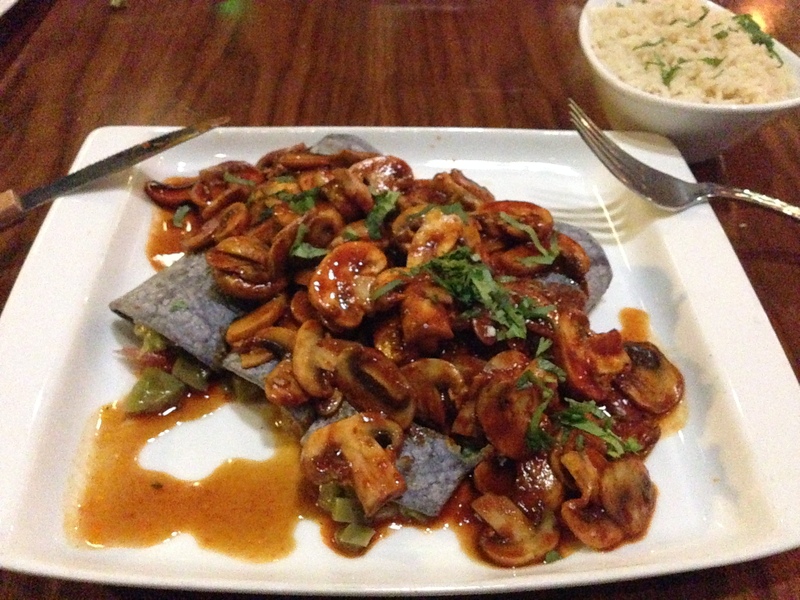 For vegans or those who like their food wrapped, the Enchiladas Yashu de Zapoteca ($13) feature blue corn tortillas stuffed with guacamole and served with seasonal vegetables and a chili sauce. These enchiladas are as colorful as they are delicious, the guacamole adding heft to the dish without overpowering the sauce. Tequila Museo Mayahuel is, in effect, an authentic Mexican dining experience that can meet a wide range of expectations. Whether you’re looking for dinner a little out of the ordinary, the perfect cocktail to round out your evening, or even a breakfast burrito before a conference (Mayahuel offers a breakfast menu as well), you’ll find what you’re looking for here.